(SPOILERS) One thing the Colin Trevorrow and Derek Connolly scripted follow up to their ludicrously popular Jurassic World has going for it is that it finally delivers on the promise any self-respecting dinosaur exploitation aficionado would have meted out in the first Jurassic Park sequel, rather than waiting another 25 years until the fourth. Even then, they only offer a closing-moments taster of what to expect next time. But that's been a problem with this series all over, caught between the desire to have the prehistoric beasties scare the bejesus out of youngsters on the one hand and teach them the merits of preservation of endangered species on the other (if we're to be more precise, of valuing genetically modified organisms over the natural environment, but hey, let's not quibble). Trevorrow and Connolly possibly wanted to push against those restrictive ground rules, given Jurassic World: Fallen Kingdom is loaded with B-movie tropes actively exacerbated by director JA Bayona, but they ultimately lay bare their limitations as screenwriters, pulling their punches and retreading too much already well-worn ground. More than a few reviews of Fallen Kingdom have labelled it a disappointment in comparison to its predecessor, although to take that tack, you'd have to hold Jurassic World in any degree of esteem in the first place. It isn't fundamentally very much worse than any of the earlier sequels, or the original for that matter – a vastly overrated flick whose success is based more on the photorealism of its effects than the material, an inferior Westworld rehash from Michael Crichton – but you can only go back to the well so many times, stir and repeat, before audiences call you out. We saw that by the time Jurassic Park III limped onto screens in 2000, Spielberg no longer bothering even to go through the motions of signing on; with duly reflective takings, it was the very definition of a (not-so) cheap cash-in. Jurassic World rode the wave of a new generation getting to see dinosaurs on the big screen after their decade and a half absence (at least, that's the best excuse I can come up with). That freshness of audience – indifferent to the doggedly derivative content – will be absent this time, so opting to rework much of the premise and structure of the (relatively underrated, but only relatively) The Lost World: Jurassic Park is probably an unwise move if you don’t want a "fifth time isn’t the charm" style box office drop off (see Transformers: The Last Knight or, on the dinosaur front, Ice Age: Meltdown). Trevorrow and Connolly use Jeff Goldlbum's Ian Malcolm to warn of the dangers of playing God. Goldblum's generally a godsend to a movie; there’s a reason The Lost World is my favourite of the franchise, and it's all about his taking centre stage. Unfortunately, when I say he's used here, it's more that he's under-used, appearing in all of two scenes, pretty much bookends. Malcolm forwards the eminently sensible position that, having tampered with the order of things, nature should be allowed to run its course when the volcano on Isla Nubar erupts, so wiping out its prehistoric population (those that can't swim or fly, at any rate). The movie sandwiched in between consists of an almost schizophrenic back and forth between positions and pointing the finger, not helped any by the almost complete lack of identifying interest in its lead characters. Claire (Bryce Dallas Howard) continues to be blithely nondescript while offering the most perverse of motivations. She's almost infantile in her quest to preserve the creatures in the face of common sense, displaying immense naivety in taking the philanthropic offer of Rafe Spall's Eli Mills at face value and later hovering over the button that will release the dinosaurs en masse into an unguarded world. That she doesn't do it, and munchkin Maisie (Isabella Sermon) does, in no way absolves her own guilt and complicity (she did, after all, show Maisie the way), no matter how much the writers' cop-out suggests they do. Maisie, whose true status is the movie's worst withheld surprise, shows remarkably coherent cross-species empathy with her fellow clones – almost as if the writers had written a homily rather than a character – but it's in keeping with current trends of finding humanity in the creation and a lack thereof in the creator. Which might work if this had the depth of, say, Blade Runner, but the kid's little more than a cypher, apportioned chunks of the cutaway subplot as protagonist until Claire and Owen arrive at Lockwood's California estate for the big auction. The picture's backwards logic also extends sympathy to the predatory reptiles, formerly of relentlessly deadly ability (we're a long way from V here). Blue is outright the hero dinosaur once again, effectively the equivalent of Arnie's reconditioned Terminator, although she's really more akin to Ripley making friends with a xenomorph (pre-Alien Resurrection, obviously); Blue only kills humans who deserve it. A prolonged – read uninvolving – sequence revolves around treating the injured Blue, which says something about his elevated status. This "thematic" aspect also draws further attention to an unintentional stumble on the filmmakers' part, one with its roots in Jurassic World, but to an extent an issue with the entire franchise. The dinosaurs are the stars, and even in the original, the humans had short shrift (the most engaging, the aforementioned Malcolm, being side-lined in the second act, almost as if the T-Rex knew he was stealing her thunder). There's no one here to sympathise with, and certainly not engage with. Pratt sporadically raises a few chuckles – there's a sequence of superb comic timing in which, having been tranquilised, Owen must extricate himself from the path of an oncoming lava flow – but a straight hero this straight isn't his strong suit. It's brought to particular attention where the structure unflatteringly tips its hat to Raiders of the Lost Ark (hero outrunning pursuing threat, hero hitching a ride with the bad guys to the location they've taken his prize). In their messy attempts to imbue an ethical code on the treatment of science gone unchecked, it seems it's okay – as with Jurassic World– to treat the most abused creation with contempt. A straight clone (albeit a melange of dinosaur and frog DNA) is adorable, but anything gnarlier does not elicit sympathy. Last time, the Indominus rex wreaked havoc, to be put paid to by enemies of our enemy T-Rex and Mosasaurus. Here, there's an Indoraptor, destined to be impaled with impunity on a Triceratops skull by Blue, because it isn't a real fake dinosaur. This is the kind of quagmire, led by arch-sentimentalist Spielberg, the makers have sunk themselves in. Bayona shoots his Indoraptor like a classic era horror creature, all sinister shadows amid rain-lashed mansions, but he's strangely unsuccessful at ratcheting up the tension during the final act. In part this is going wanting for investment in the characters, but it's also because the structure is so sloppily cobbled together that it's hard to care about the fates of anyone or anything. It's also unfortunate that relocating a science fiction monster to a domestic setting invokes the best forgotten Alien vs. Predator: Requiem, complete with the menacing monster appearing in a bedroom. 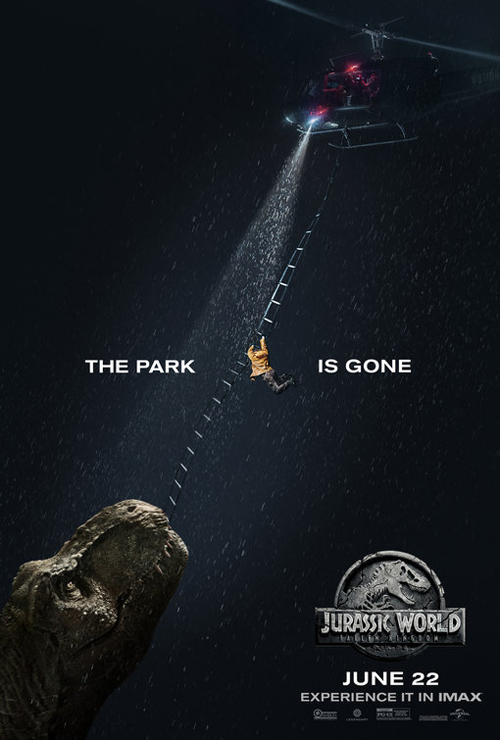 Part of it is also down to Amblin wanting to preserve a semblance of respectability, responsibility and restraint; in the final moments we see a T-Rex roar at a lion, and post-credits pterosaurs hitting Vegas, but there's no way the sixth movie is going to be the guilt-free, dinosaur-slaying carnage that ought to be on offer. Bayona fares better with the earlier on-island action, surprisingly (I’d have pegged it for the other way round from the trailers), eking out some tension from the volcano vs good humans vs bad humans and bad dinosaurs quandaries. An attack by a Baryonyx is much more effective than anything occurring in the latter half of the movie. Like The Lost World, Fallen Kingdom endeavours to furnish us with some human villains, worst of the bunch being Eli, entirely evil because that’s what he is (he even wants to remain Maisie's guardian, for no obvious reason other than to spite Geraldine Chaplin's housekeeper). Spall makes it easy to loathe the character, but that doesn't excuse how tiresomely one-note Eli is. In contrast, Ted Levine has a lot of fun with mercenary Wheatley, to the extent that you end up rooting for him. He at least has a sense of humour, even if he can't survive being written into stupid situations. BD Wong is wasted again as Henry Wu; as with Levine and Goldblum, the movie perks up whenever he's on screen, only to struggle to re-engage once we've cut away. Justice Smith is the comedy IT guy (he' a first-rate screamer), Daniella Pineda the entirely unlikely vet (covered in tats, wearing glasses while clearly not needing them because lo-and-behold she's gorgeous), James Cromwell the retconned former partner of John Hammond (it's a Cromwell "picking up a cheque" part) and Toby Jones an auctioneer acting through prop dentures. Fallen Kingdom has its requisite cruel kills (a tech guy escapes a T-Rex in the teaser scene, only to be gobbled by a Mosasaurus; Wheatley loses an arm before being wolfed down by the Indoraptor; Jones' Eversol flees the Indoraptor into a lift, seals the doors and breathes a sigh of relief, only for them to reopen on the same floor) but there's nothing likely to be as controversial as the death of Zara in the last instalment (less is the pity; at least it made you sit up and take notice). There's a scene in which Eli accurately points out Owen and Claire's responsibility for what has transpired, but it feels like the writers pre-empting criticisms rather than something leading up to a reckoning, thus having their cake and eating it; ultimately, we're supposed to side with our heroes because the plot demands it, rather than because they deserve it. Trevorrow and Connolly kind of had the right idea with Jurassic World: Fallen Kingdom, even if that idea was to lift the plot of the The Lost World (right down to boasting about its darker tone), but they singularly fail to make it compelling, and Bayona can't work miracles. Trevorrow, having been banished from Lucasfilm, is retreating to the safety of a $1.5bn hit for a franchise that can’t exactly say no to him for Jurassic World III, but he's the least interesting person to continue steering what was a fairly aimless ship in the first place. The Lost World made about a third less than Jurassic Park globally, and Jurassic Park III a third less than The Lost World; if Fallen Kingdom is representative, this trilogy will be lucky to chart that kind of business.